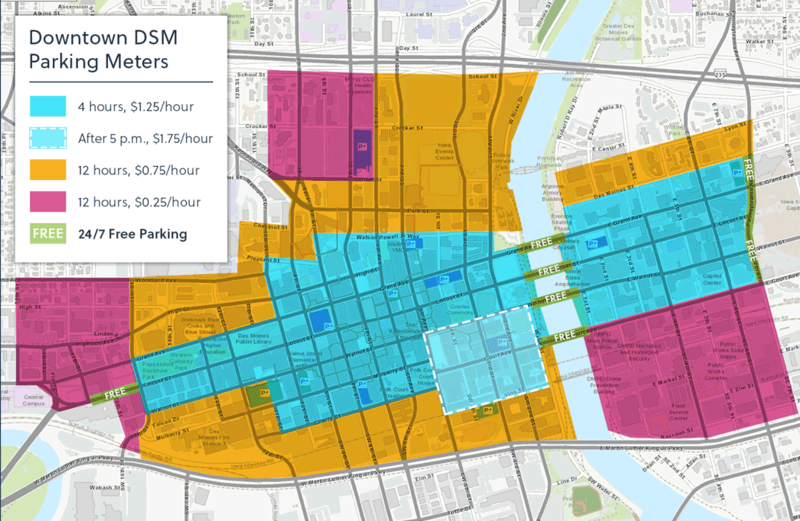 The City has launched a new parking strategy for downtown Des Moines to manage parking to support area businesses and an increasingly active downtown with a new variety of visitors. The strategy is to increase available parking in downtown by adding more on-street parking spaces, creating FREE parking areas, changing rates and expanding times at the parking meters and parking ramps to create a system that is simple and fair for residents, business owners, employees, and visitors. All downtown parking meters are enforced Monday through Saturday, 9 a.m. to 9 p.m.
On Sundays, parking at any City-owned parking ramp or parking meter is free (excluding special events). FREE or discounted parking areas in surface lots and on the periphery of downtown. More on-street parking spaces and removal of peak hour parking restrictions in key areas. Decreased hourly rates in parking ramps to encourage long term parking in the ramps. New installation of credit card Smart Meters in core areas. See "HOW METERS WORK" for more info. Parking meter rates vary from $0.25 per hour to $1.25 per hour. Higher rates are charged in areas of higher demand. In the Historic Court District after 5 p.m., meters will cost $1.75 per hour. See Downtown Parking Rate Plan for more info. Garage parking has been reduced to $1 per hour ($10 daily max). City-owned parking ramps charge Monday through Saturday, but parking at meters and ramps is FREE on Sunday! Over 900 FREE off-street and on-street parking spaces are available. Monday to Friday, 5 p.m. - 5 a.m. and all day on weekends. Monday to Friday 6 p.m. - 2 a.m. and all day on weekends. FREE parking all-day in these areas. Vehicles must move every 24 Hours. The Historic Court District and Western Gateway have “silver-top” IPS Credit Card Meters. IPS Meters are not only convenient because they take credit cards, nickels, dimes and quarters but with the more traditional M5 Single Space Meter, you simply pull up, pay and walk away. It’s that simple. Watch this Demonstration Video and see for yourself. San Diego-based IPS Group, Inc. is a design, engineering and manufacturing company focused on low power wireless telecommunications and parking technologies. How Will the Parking Changes Be Evaluated? The goal of this new strategy is to manage on-street and off-street parking to support area businesses and an increasingly active downtown with a mix of retail, restaurant, and residential parking demand. Previous occupancy of on-street parking spaces is compared with new data collected from the new strategy to gauge changes in parking availability. Sales tax receipts before and after the changes are also compared to measure impact on the business community. 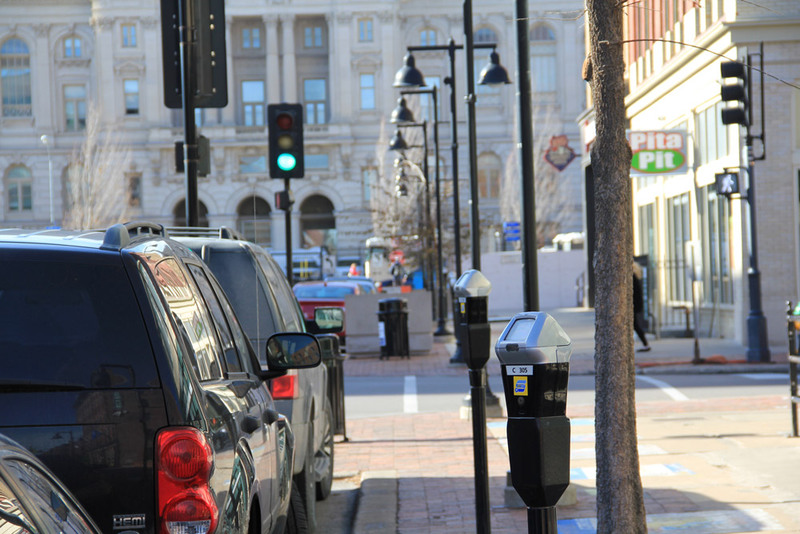 City staff will continue to review rates and times at the parking meters and ramps to create a system that is simple and fair for residents, businesses owners, employees, and visitors with the desired results to support an everchanging downtown Des Moines. To appeal or pay a parking ticket; visit the Clerks Office Page for appeal or click here to Pay Online. The SmartCard is a great payment alternative that works in most of the city’s 3,500 metered parking spaces. The Smart Card is a pre-paid parking card. The user preloads a set amount of value to the card and then can use it as payment at any of the on-street meters in downtown that have the SmartCard Logo on the outside. A person can insert the SmartCard into a parking meter and buy time on the meter. If there is time left on the meter when the person returns, they can reinsert the same SmartCard and have the remaining value on the meter refunded back to their SmartCard. You only pay for what you use! You can only refund back to the same SmartCard that put the value on the meter. Because the SmartCard has value, it should be safeguarded. There are no refunds for lost, stolen or damaged cards. Copyright ©2019, IPS Group, Inc. All Rights Reserved.